The rocket attack threatened to undermine Egyptian-mediated efforts to cement a deal that the Gaza Strip’s Hamas rulers hope will ease a crippling Israeli-Egyptian blockage of the crowded territory. No casualties were reported and no Palestinian group claimed responsibility for the rockets, though they appeared to have been fired in retaliation for the deaths of the protesters. Hamas had pledged to keep the crowds a safe distance from the fence to avoid inflaming the political atmosphere during negotiations on a possible easing of the blockade. 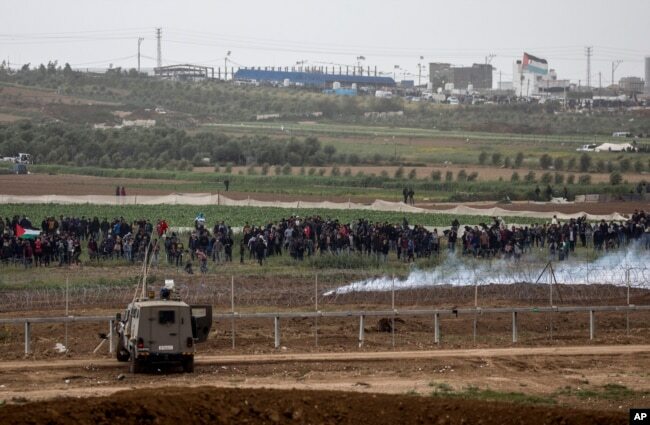 Israeli soldiers take positions on the Israel-Gaza border during a Palestinian protest, March 30, 2019. Israeli Prime Minister Benjamin Netanyahu is seeking his fourth consecutive term in April 9 elections, but is facing a serious challenge from a group of ex-army chiefs who have criticized what they say is his failed Gaza policy. With a lack of alternatives, Netanyahu has been forced at times to rely on Hamas to maintain stability along Israel’s volatile southern front. Hamas, meanwhile, faces growing unrest in Gaza as a result of worsening conditions after more than a decade of the Israeli-Egyptian blockade. The two countries imposed the blockade in 2007 after Hamas, an Islamic militant group that seeks Israel’s destruction, seized control of Gaza from the internationally recognized Palestinian Authority.